Last week, the United States government enacted the Women, Peace, and Security Act of 2017, which was signed into law by President Trump on October 6. The bipartisan act will strengthen efforts to prevent, mitigate, and resolve conflict by increasing women’s participation in negotiation and mediation processes. This new law builds on the growing policy framework chiseled over the past two decades to improve women’s participation in security processes, from passage of the landmark Security Council Resolution 1325, which was approved at the United Nations in 2000, to the adoption of the first-ever U.S. National Action Plan on Women, Peace, and Security in 2011, which was implemented by Executive Order 13595 and updated in 2016. By passing the Women, Peace, and Security Act, Congress has ensured that these efforts have the full force of law. In recent years, as the evidence of women’s contributions to peacemaking and peacekeeping has grown, women’s role in conflict resolution and security has received greater international attention. Since 2000, the UN Security Council has enacted eight resolutions to promote women’s participation in conflict resolution and reconciliation processes and address issues such as conflict-related sexual violence. 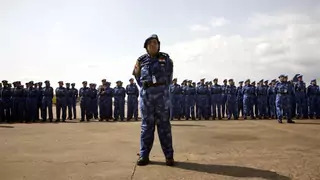 To date, sixty-nine countries have launched National Action Plans to increase women’s participation in security processes and improve women’s protection from threats of violence, from developing nations like Afghanistan and Kenya, to high-income countries like Japan and the UK. Regional and multilateral bodies—including the African Union, the North Atlantic Treaty Organization, and the Group of Seven (G7)—also have outlined commitments to advance women’s participation in preventing and resolving conflict.